Sutton Rectory stood in Rectory Park beside Rectory Road. It was surrounded by the glebe land belonging to the rectory, including the present Rectory Park and some fields on the opposite side of Rectory Road. The graveyard at Sutton church was nearly full, so the Rector set out part of his glebe as a cemetery, consecrated by the Bishop of Worcester in 1880. The Rector then turned his attention to developing the glebe land next to the new cemetery. The Rector of Sutton was the Reverend William Kirkpatrick Riland Bedford, a very wealthy man with a large family, and when everybody was at home even the huge rectory was bursting at the seams, so he decided to build a house for his eldest son and his growing family. The glebe land next to the cemetery was the chosen site, and a legal loophole was found so that the house would belong to the Rector rather than the Parish. Four acres of land were leased to Thomas Barnsley, a Birmingham builder, on condition that he build a house which would then be leased back to Riland Bedford for ten years, the house to cost at least £3,000. The house, named Broomieclose, was soon ready, receiving its certificate from the architect Yeoville Thomason on the first of September 1882, and the 1885 rate book shows W.C.Riland Bedford as the occupier. W.C. Riland Bedford succeeded his father, who retired in 1892, as Rector of Sutton, and Broomieclose was sold to Colonel S.D.Williams. Twenty years later it passed to Ramsay Winter, a chocolate manufacturer, who renamed it Good Hope (he moved there from a house in Streetly Lane, also called Good Hope). The big Victorian house was very expensive to run as a private residence, and in 1943, after Ramsay Winter’s death, the building was taken into use as an auxiliary hospital. The patients treated there were medical and post-operative cases, mostly soldiers, who were moved elsewhere for further treatment after a few days. It was run as an off-shoot of Sutton Cottage Hospital, the sister in charge, who had a flat in Good Hope House, acting under the orders of the formidable Matron of the Cottage Hospital. Someone who spent a year nursing at Good Hope in 1945 spoke of wearing a blue and white uniform with rolled-up sleeves and being paid seven shillings and sixpence a week. The nurses and the matron lived in the upstairs rooms at the cottage hospital, and discipline was very strict - before speaking to matron or sister a nurse had to roll down her sleeves and put on the starched cuffs. The patients also lived in fear of matron, so there were no objections when all the beds were moved out of the largest room for the hospital dance. This was the ball room, and for one night Good Hope House relived its Edwardian glory as the nurses danced with their guests. 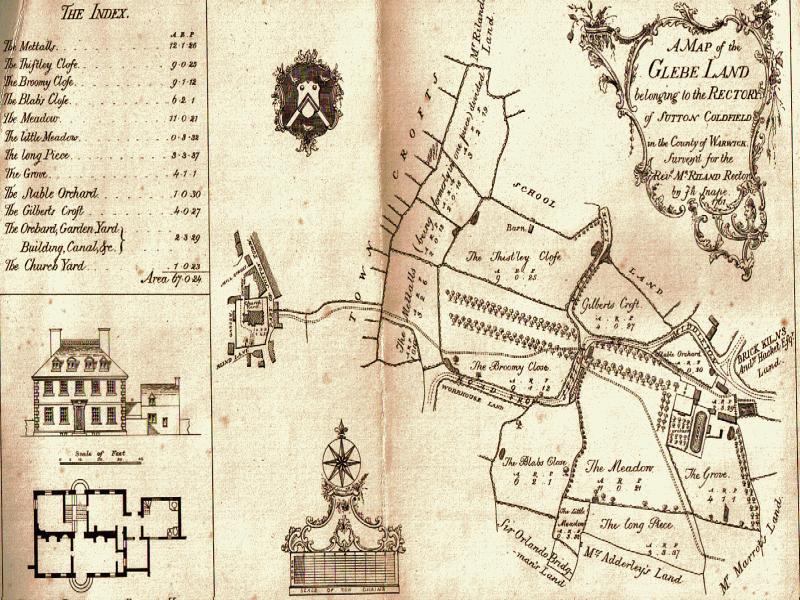 Broomy Close on Snape’s 1761 map of the Glebe Lands. Rectory Road was later laid out along the dotted line above the words “Broomy Close”, the cemetery and Good Hope House were sited on the part formerly occupied by the avenue of lime trees.